I have been looking for this recipe since I got good at cooking. That was sometime in the early 1980s. I had been a fair hand at cooking before that, but I met some people are superb cooks and got inspired by them. I first at this soup during lunch while working at the department store which you see in the image, above. So good tasting was it that I have yearned to make it ever since. I tried following the recipe printed in The Gourmet Cookbook to no avail. That cookbook should have been an authoritative source. I have read about how this simple recipe was developed at Les Halles the Parisian 'Grand' Central Market. Most cities have a Central Market or sometimes called a Grand Central Market. It is the wholesalers market where the restauranteurs come to buy their ingredients, daily. Typically, these markets open before dawn and close by Noon. 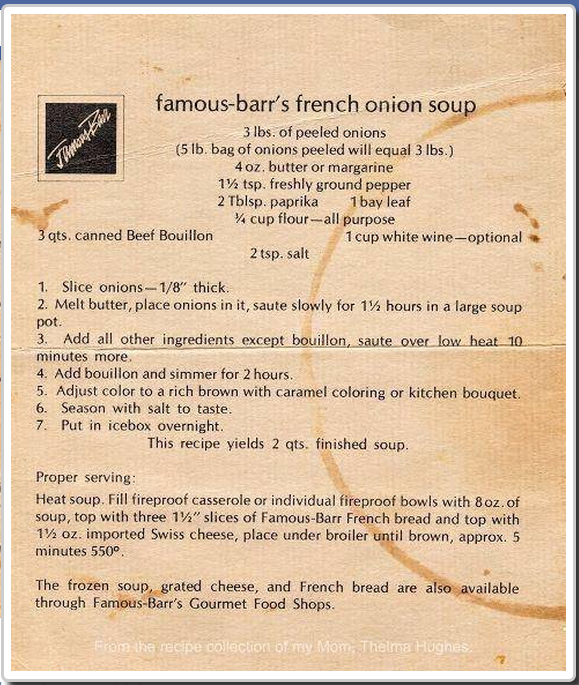 The story of the French Onion Soup, as I have learned it is: after the frenzy of buying, the buyers repaired to a restaurant located within Les Halles and had this soup to warm themselves up. Paris winter mornings would be a good time for that. Some excellent 19th century images can be seen here. The soup I had had a peculiar tang. I have come to believe that either sherry and/or sherry vinegar is involved in this. Yet, the recipe above calls for white wine. Was the author of this recipe trying to hide something? Maybe, but I've discovered the Secret Ingredient none-the-less. 1 - Slice onions — 1/8" thick. 4 - Add bouillon and simmer for 2 hours. 6 - Season with salt to taste. 7 - Put in icebox overnight. This recipe yields 2 quarts finished soup. brown, approx. 5 minutes at 550°. through Famous-Barr's Gourmet Food Shops. From the recipe collection of my Mom, Thelma Hughes.